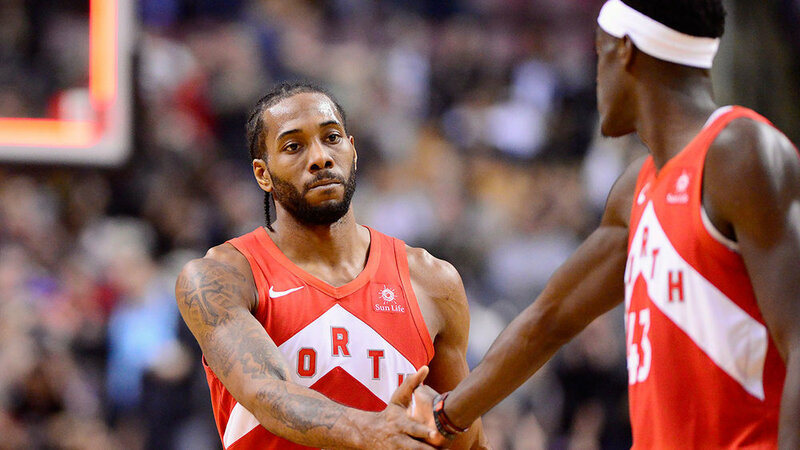 The Raptors just played their 52nd game of the season, and even though it’s not exactly halfway through the year, we’re approaching things such as the trade deadline and the All-Star Game. So it’s a good time to evaluate the team. This article will feature my grades from A to F each of the Raptors’ players. This will only feature regular rotation players, so I won’t be doing grades for Chris Boucher, Malachi Richardson, etc. These grades are mostly based on overall play, but also on the expectations for the players coming into the year and whether they’ve exceeded them or not. Coming into this season, it was hard to predict what Kawhi’s season would look like. He only played in 9 games last year, so it was unknown if he could get back to his All-NBA form from two years ago. So far, Kawhi has been incredible for the Raptors and has probably passed my expectations to this point. Aside from his normal dominance on defense, Kawhi has been excellent offensively this year, scoring at a career-high rate. Kawhi is also rebounding the ball more than he ever has in his career and that’s been key for a team that has lacked an elite rebounder for a large portion of the season. He has missed 14 games due to rest and a few nagging injuries, but when he has played, he’s been a joy to watch for Raptors fans on both ends of the court. Just like Kawhi, Kyle Lowry has been in and out of the lineup this year for the Raptors and hasn’t played an extended group of games with Kawhi in a while. Lowry has been good defensively this year, among the league leaders in charges taken, but his year offensively has been puzzling. He’s getting the most assists of his career, which is great, but all of his scoring numbers are down from last year. He’s currently shooting his lowest percentage from 3 since the 2009-10 season, and he’s also not taking as many looks as he normally does. I’m fine with him being a pass-first guard, but at some point the Raptors will need some scoring from Lowry and he has to be able to provide that. Siakam has exceeded everyone’s expectations this season, and has made himself into a borderline All-Star. He went from being a nice bench piece last year to now being the 3rd option on the Raptors. Siakam has improved in basically every aspect of his game, and that’s why he’s one of the lead candidates for the Most Improved Player Award. Along with being very good at driving to the rim, Siakam has also developed a decent jumps shot and is now shooting 10% higher from 3 than last year. Many people viewed Danny Green as a throw-in from the Kawhi/DeMari trade, but so far this year he’s been a great contributor for the Raptors. Green has been the team’s best 3-point shooter and has hit a few clutch shots in close games. He’s also been excellent defensively this year, and is probably the team’s 2nd best defender behind Kawhi. He’s had a few off nights here and there, but overall, Green has been a great addition to the team so far. After a disappointing 2017-18 season, Serge Ibaka has bounced back and been a very important player for the Raptors this year. Despite having a poor year shooting the 3, Ibaka has raised his overall shooting percentage to 53%, and that has a lot to do with him mastering the mid-range jump shot off the pick and roll. Ibaka has played primarily as a centre this year, and that has worked out very well. He’s fit in perfectly in that role, and instead of just being a spot up shooter from the perimeter like he was last year, Ibaka is getting much better looks and scoring more because of it. Fred VanVleet has had an interesting season to this point. It’s not that he’s been bad it’s that he hasn’t taken that step forward from last year. He’s had some great games, but he’s been pretty inconsistent overall. VanVleet’s 3-point percentage is down from 41% to 37% from last year, which makes him a less valuable player. I expect him to improve down the stretch, but to this point, VanVleet’s season has been a bit underwhelming. OG has missed a handful of games due to personal reasons this year, and I imagine it’s been tough for him to focus on basketball. This probably has something to do with his slow first half of the season. I expected him to play a bigger role on this team, but his poor shooting makes him almost unplayable in late game scenarios. Not only is his 3-point percentage down 3% this year, his free throw shooting has been extremely poor. He’s shot just under 40% from the line this year, which is just unacceptable at the NBA level. With all of that being said, I do expect OG to bounce back and play well down the stretch once he gets back into the rhythm of playing more often. After having a very disappointing 2017-18 season, Norman Powell has bounced back and has been a solid contributor this year. I wasn’t expecting much out of him this season, but he’s played well enough to get consistent minutes. Powell was sidelined for a while with a shoulder injury, but since returning from that, he’s been a crucial player off the bench for the Raptors, and is showing that he’s still got some upside. He’s raised his 3-point percentage exactly 10% from last year, and is shooting 57% from inside the arch. He may still be a bit overpaid, but it’s at least good to see him bounce back and play good minutes for the team. He’s picked it up recently, but overall, this season has been a disaster for C.J. Miles. His main role on the team is to shoot 3’s well, and he’s currently shooting his lowest percentage from deep since the 2006-2007 season. Like I said, his main role is to be a shooter, and when he’s not doing that well, he doesn’t do much else for the team. I’m hopeful that he’ll continue to shoot like he has as of late, but it’ll take a really hot stretch to make up for how much he struggled to start the year. Valanciunas has been out since December 12th with a thumb injury, but is apparently nearing a return to action. He’s had his minutes decreased this year, but he’s adjusted well to his new role and has played pretty well. Nick Nurse has been putting him in positions to succeed, with match-ups against other big men that Valanciunas can play well against. I’m looking forward to JV’s return to the lineup, because the Raptors need some rebounding help (They also need to stop giving Greg Monroe minutes). Greg Monroe is a good depth centre to have, but watching him continue to play over Chris Boucher has been frustrating for me. Monroe doesn’t excel in any specific area of the game, and is a liability in pretty much every area. His defense is subpar, he misses too many layups, and he’s the king of missing 2 free throws in a row. I don’t mind seeing him play every once in a while, but once Valanciunas gets back, I hope that’s the end of Monroe’s consistent playing time.